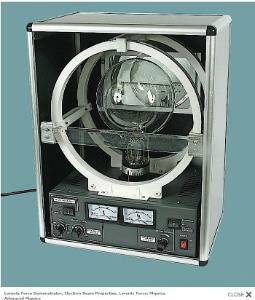 The Lorentz Force Demonstrator is a fine-beam tube device. A sharply focused electron beam is projected into a vacuum containing a trace of inert gas. Ionization of the gas around the electron beam creates a glowing discharge, marking the path of the electrons and helping to maintain the sharp focus of the beam. The demonstrator shows deflection of the beam by transverse electric fields and by magnetic fields of various orientations. The value of e/m can be found by bending the electron beam into a circular path with a homogeneous magnetic field and measuring the accelerating voltage of the electron gun, the strength of the magnetic field, and the radius of the circular beam path.